Here’s a perfect dessert – both refreshing and luscious at the same time. You may not even want to share, but if you do, this recipe makes 6 servings. So here’s how to do it. Impress your friends this weekend… or maybe just yourself! Note: Be prepared. Start in the morning so mousse has time to chill and granita has time to freeze. 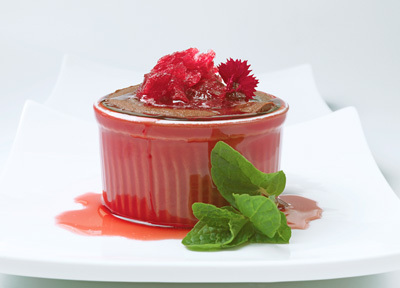 Combine 2 cups pomegranate juice and 1/4 cup sugar in 8 x 8 x 2-inch glass baking dish. Stir mixture until sugar dissolves. Cover and freeze until granita is firm, at least 8 hours or overnight. Combine remaining 2 cups pomegranate juice and 3 tablespoons sugar in heavy medium saucepan. Bring to boil, stirring mixture until sugar dissolves. Boil until mixture is syrupy and reduced to generous 1/2 cup, 12 to 14 minutes. Transfer syrup to small bowl. Chill until cold, at least 2 hours. DO AHEAD: Granita and pomegranate syrup can be made 3 days ahead. Keep granita frozen. Keep pomegranate syrup chilled. Place Chupon White Matcha Chocolate and pinch of salt in medium metal bowl. Pour 1/2 cup cream into small saucepan. Scrape in seeds from vanilla bean; add bean and bring to boil, whisking to blend. Remove vanilla bean. Pour hot cream mixture over chocolate in bowl; let stand 1 minute, then whisk until chocolate is melted and mixture is smooth. Cool until barely lukewarm, 5 to 10 minutes. Using electric mixer, beat remaining 1/2 cup cream in large bowl until stiff peaks form. Fold in barely lukewarm melted chocolate mixture in 2 additions, then fold in crème fraîche. Divide mousse among 6 dessert glasses, leaving enough space at top of glasses to spoon granita over. Cover and chill until mixture firms up slightly, at least 8 hours or overnight. DO AHEAD: Can be made 2 days ahead. Keep chilled. Using fork, scrape surface of granita, forming icy flakes. Top each glass of mousse with generous amount of granita, dividing equally. Drizzle each lightly with pomegranate syrup. Sprinkle with pomegranate seeds and serve immediately.